Arbor Day, 1932, oil on masonite panel by American painter Grant Wood (1891–1942). 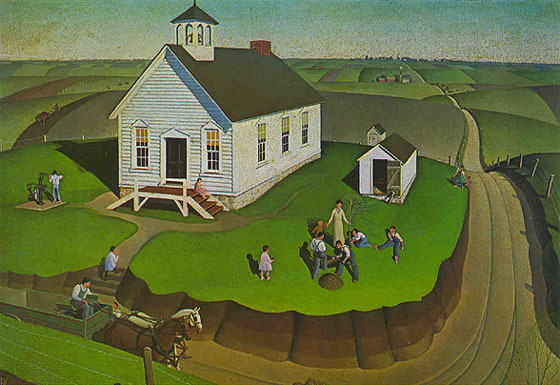 Image courtesy of “Going Back to Iowa: The World of Grant Wood” (University of Virginia American Studies Program). H. F. Fehlendt, the superintendent of schools in Ozaukee County in 1894, included the following passage in his annual report to the Wisconsin Department of Public Instruction. Arbor Day was generally observed and more trees were planted than ever before. At the Holy Cross school more than two hundred trees were planted. A number of memorial trees were planted in memory of such men as Washington, Columbus, Longfellow, State Supt. O. E. Wells, Hon. J. Sterling Morton, originator of the Arbor Day, and others. . . . All this helped to arouse a wonderful interest in Arbor Day. The parochial schools vied with the public schools in celebrating the day. Each teacher received a copy of “Arbor Day Leaves” containing suitable programs, and an Arbor Day circular was sent to each teacher as well as to each district clerk. To J. Sterling Morton, ex-Governor of Nebraska and Secretary of Agriculture under President Cleveland, belongs the honor of originating this tree-planting festival, and he is popularly known throughout our whole country as the "father of Arbor Day." So well has the day been observed in Nebraska since 1872 that there are now over 700,000 acres of trees in that state planted by human hands. The pamphlet included “About Trees,” a prefatory chapter by Morton, whose mania for tree-planting began in the mid-1850s, after he and his wife moved to a bare, windswept 160-acre homestead in newly incorporated Nebraska City. Their house, originally a four-room cabin, eventually grew into a 52-room replica of the White House. Not long after their arrival in Nebraska City, the couple began planting trees on their estate, much of which has been preserved as Arbor Lodge State Historical Park and Arboretum, designated a National Historical Landmark in 1975. When the U.S. Forestry Division prepared Arbor Day Leaves for publication in 1893, only four of the forty-eight states had not yet officially recognized the holiday’s observance—and the holdouts added the commemoration to its calendars within another two years. The most common date for observances was—and still is—the last Friday in April, but a number of states have varied the dates to accommodate the best tree-planting weather. (Hawaii and Texas, for example, celebrate on the first Friday in November.) Although overshadowed in recent years by Earth Day, many Arbor Day festivities are still planned nationwide each year. A tree is the perfection in strength, beauty, and usefulness of vegetable life. It stands majestic through the sun and storm of centuries. . . . If you don't see the full selection below, click here (PDF) or click here (Google Docs) to read it—free!